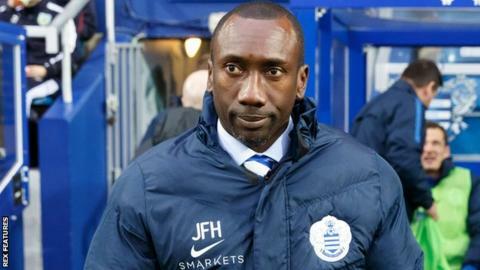 Queens Park Rangers manager Jimmy Floyd Hasselbaink says his side are slowly regaining their self-belief following his appointment as boss last week. The Dutchman drew his first game in charge against promotion-chasing Burnley on Saturday. "There was a lack of confidence, but they are coming out of that," the 43-year-old told BBC Radio London. "We want to give our players as much room as possible to be able to express themselves and play with freedom." QPR are currently four points outside the Championship play-offs places as they seek an immediate return to the Premier League following relegation last season. Hasselbaink says that, following the goalless draw against the Clarets, his squad know they can improve before they welcome unbeaten league leaders Brighton to Loftus Road on Tuesday. "There is a way of working we expect. They are getting used to it and know we are going to work in a certain way," the ex-Burton Albion boss said. "They know where we are going and they are comfortable with it. We can improve and try to become a better, solid team, but that takes time and repetition." Meanwhile, the former Netherlands international says striker Charlie Austin is close to making his first start since 7 November. Austin, 26, has featured from the bench in the last three matches following three weeks out with a calf injury. "My long-term vision with Charlie is that he is starting game in, game out," Hasselbaink added. "He is a good striker and I think the world of him. He is somebody everybody would want in their team. "It is just a matter of time. There is no timescale, but he is very close."